It is the european heaviest bird and the biggest flying bird. Some of the biggest males weighing up to 20kg. Extremadura holds about 25% of the spanish great bustard population, that is about the 15% of Earth population. 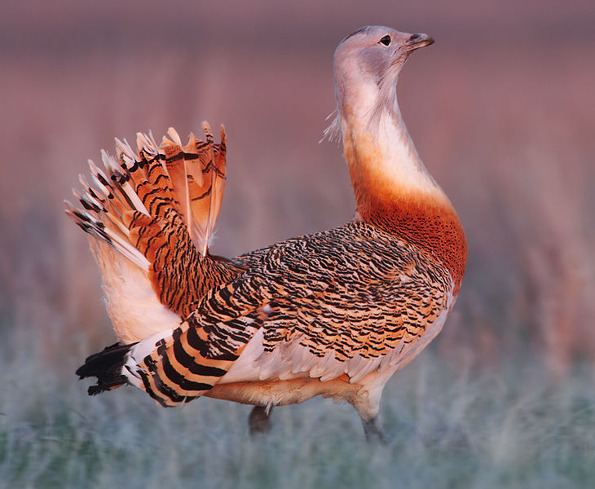 The Great Bustard (Otis tarda) lives in plains and extense pastureland. Spain has the 65% of the global population of great bustards. Extremadura is the second most important region in Spain, with 25% of Spanish population, so it is about the 15% of the total population in the world. When the winter season is ending, at February, the groups of males and females begin to come together in courtship leks. Those groups can be composed by hundreds of bustards, mainly along March and April. All those places are perfect for practising birdwatching, not only related with great bustards, but with many other bird species.